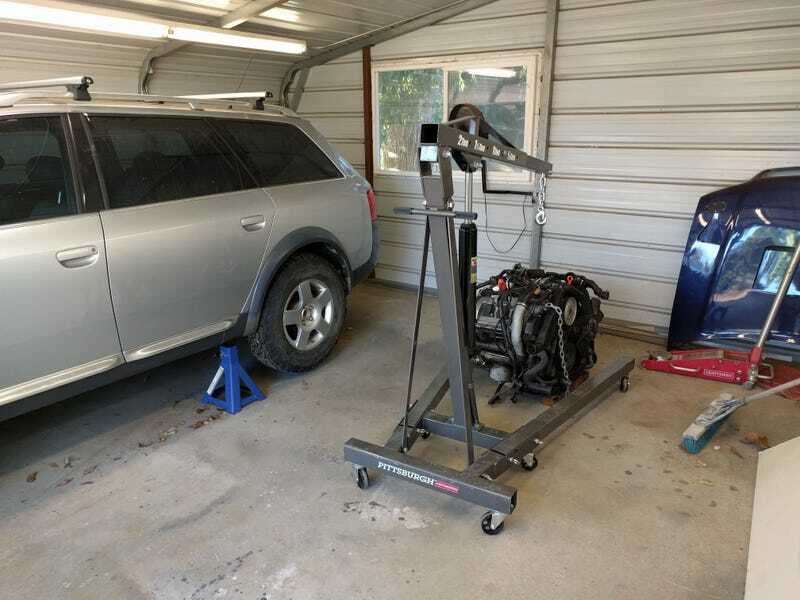 Expedition Allroad Update - The Engine is Here! I finally picked up the engine! Luckily I was able to borrow my buddy’s hoist and had a friend there to help me load that in the truck, which saved me some serious effort. I didn’t think to cover the turbo oil return lines, so those puked out some lovely oil into the bed of the truck, but it wasn’t too bad. Project Expedition Allroad chugs along as planned. Yes, before you ask, I am indeed a masochist. But c’mon guys, 6-speed manual! As you can see in the pic up top, the Allroad is sitting on jack stands just to keep the rear bags from sitting down on themselves completely deflated. When I put it in jack mode it lowered down to level 1 and was sitting directly on the wheel wells. Since the engine obviously won’t run, the only way to run the compressor is to hook up a battery directly to the compressor and manually override it to inflate the bags. I was going to do this, but I figured it would just be right back down sitting on the rear bags again soon enough, so why bother. I’m picking up a Harbor Freight engine stand this week. Anyone have experience with these ultra cheap ones? $60 is ridiculously cheap, and its rated for 1000lbs, which my engine comes no where near. Got the clutch as well. Managed to snag an insane price on a Luk kit that came complete for about half of what everyone else was charging for the exact same part number. Only $160 shipped! So while I’m getting the engine together with all the new parts, something for me to chew on is the issue of bump stops. The Allroads have them built-in inside the airbags, so I’m thinking about taking one out and checking out how I can extend the bump stop so if/when I have total bag failure (which is pretty likely), I can still move it under its own power and get it home. I found this thread where a guy just bought a kit off eBay and threw in a cheap set to help his problem with lowering his, so from seeing what that looks like, I’m thinking I might be able to stack one and a half or two of those to get the proper spacing needed to not grind my big tires in the wheel wells. The other option I have would require some light fabrication, but might be the better long term solution, are hydraulic bump stops. These would give a more forgiving ride when approaching the limits, but more importantly, lessen the shock of hitting the bump stops in the first place, and hopefully take some stress off of the already relatively fragile A-arms. I’m going to pull off a tire front and rear and see if there is a good spot to mount these. On top of fabrication, these are definitely the most expensive option, and will probably run me upwards of $400 in parts alone. I’m definitely hesitant on that idea based on cost alone, but it would be a seriously awesome solution.